Well, it certainly seems like the world has gone crazy if you turn on the news lately, doesn't it? And Lord knows we could all use a little solace, peace, and simplicity to offset this constant bad news and negativity. I ran across some scripture the other day that just wrapped around me like the strength and security of a mountain mamaw's hug (I kind of like to think that God made mamaws so we could learn a little bit about His own love for us through them! God's good like that, you know.). Many people don't read the King James version of the Bible anymore, but this scripture I saw was from the King James...and it offered up just the perfect reassurance needed in a current world of chaos. 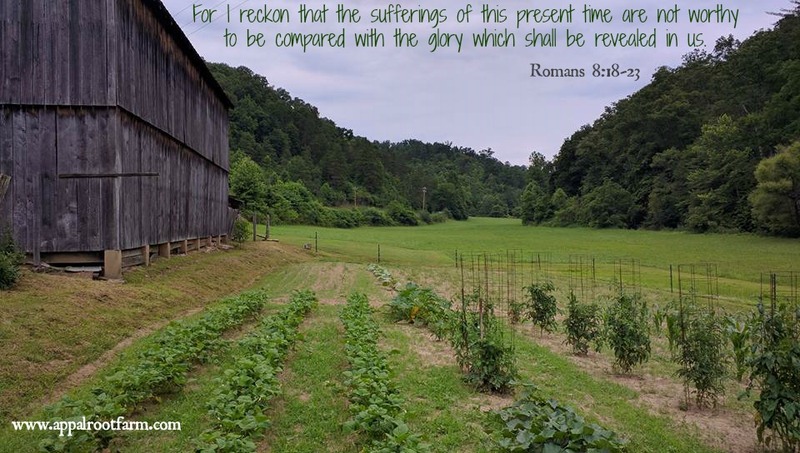 "For I reckon that the sufferings of this present time are not worthy to be compared with the glory which shall be revealed in us." Romans 8:18-23 Love it! Don't you just adore that use of "reckon" thrown in there? God knows the perfect brand of comfort each of us needs...and, if like me, you've heard a thousand "I reckons" in your life, this scripture sure does offer comfort akin to the best mamaw hug ever was! And one thing's for certain, this world sure could use a whole lot more of Jesus and mountain mamaw hugs right about now! Speaking of mamaws...mine sure did love to garden! My mind turns to her often this time of year, as gardens produce their summer bounty. She had a green thumb with just about everything. She'd grow beans, tomatoes, both "arsh" and sweet potatoes, cabbage, lettuce, corn, squash, watermelon...and you name it, she probably raised it at one point or another. She and my papaw even grew peanuts and popcorn at times! 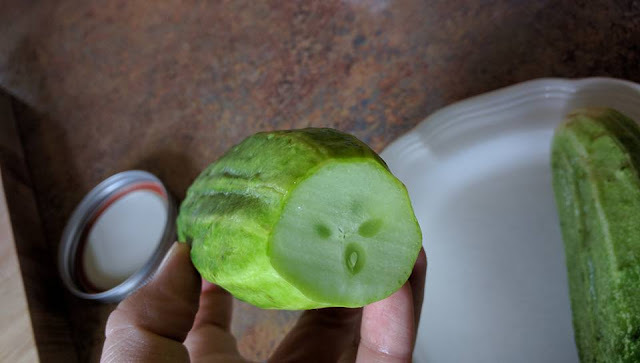 Oh, and cucumbers! Now, that is one of my favorites! 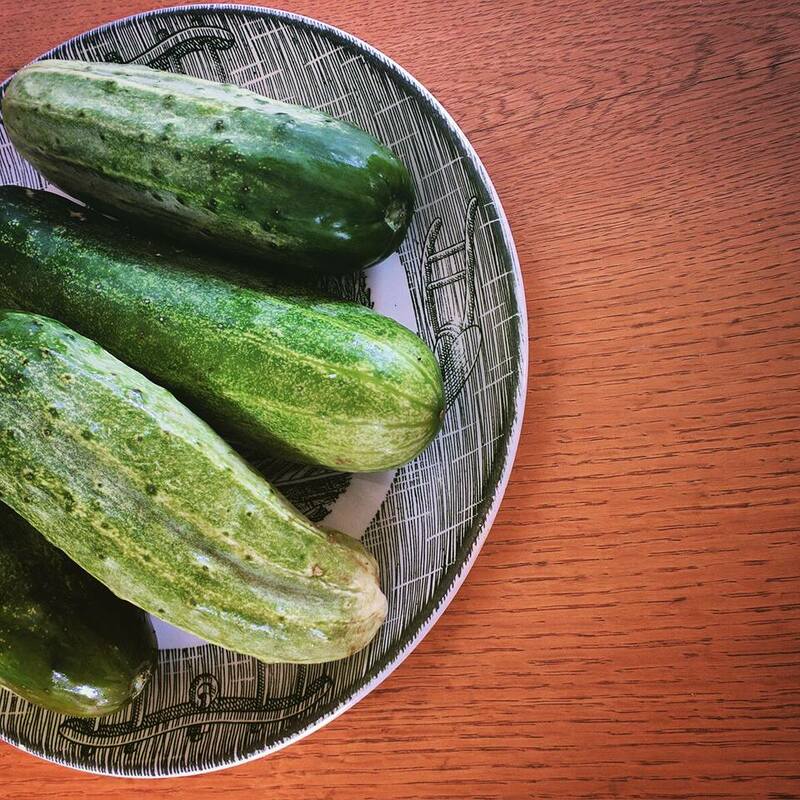 Nothing quite tastes as much like midsummer as a garden fresh cucumber does. And when my mamaw would grow a lot of cucumbers...she would often turn them into something truly wonderful! Now right about here, most folks are going to assume that I will launch into a discussion of pickles that my mamaw made. Well, my mamaw did occasionally make pickles...but I don't think my mamaw was a true fan of actual pickles (and for that I'm glad because I'm not either). 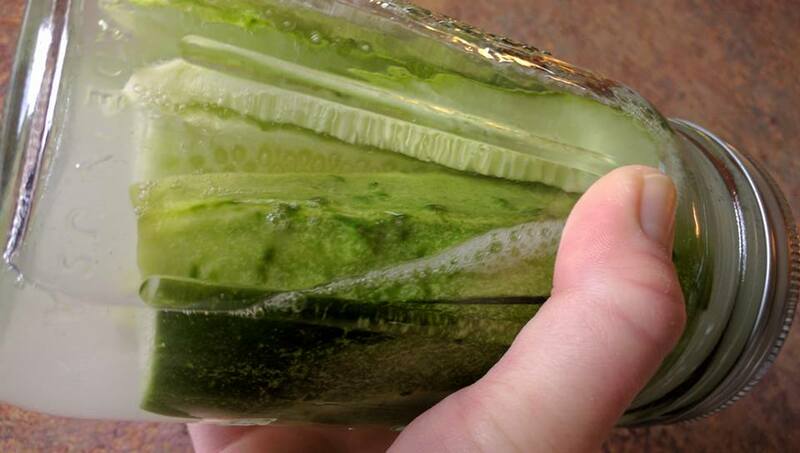 So what my mamaw turned to most often was a yummy pickle alternative that she simply called "salty cucumbers!" 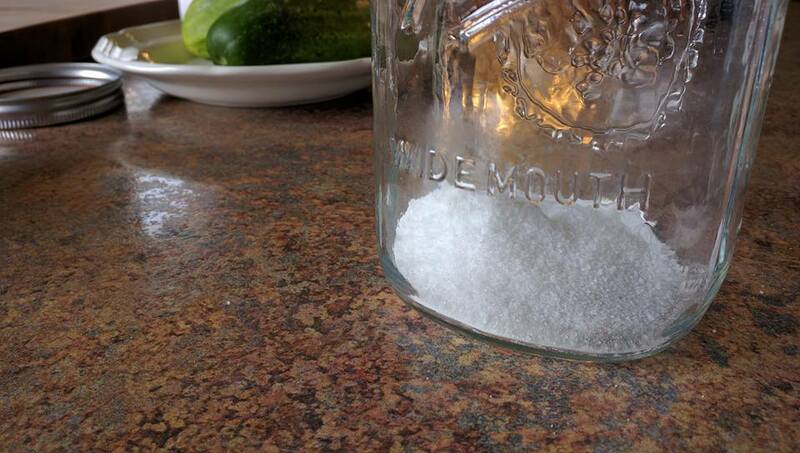 Years ago throughout Appalachia, people would often use salt alone as a pickling agent instead of vinegar. Vinegar was pricey...and wasn't something that folks always had on hand like they did salt. 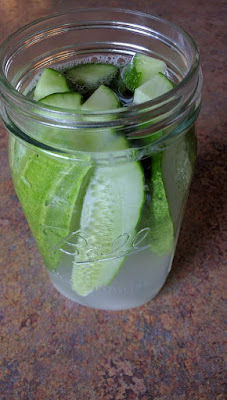 If you leave salted water alone on veggies, such as cucumbers, long enough, it will pickle and preserve them perfectly. You could either eat the salty pickles as is, or add vinegar and spices (if you had them) after salt pickling to get an even more flavorful pickle. But my mamaw liked to cut the salt pickling process far short of any true pickling. What she created was a cucumber with a pickle texture and consistency, salted to perfection, but still retaining delicious hints of a fresh, summery, "straight from the garden" taste. So yummy, easy to make, and much quicker to create than true pickles....these "salty cucumbers" were one of my mamaw's summer go-to's! In my opinion, they were always a delicious accompaniment to have along with mashed potatoes and meatloaf...but go well with so many other dishes as well. 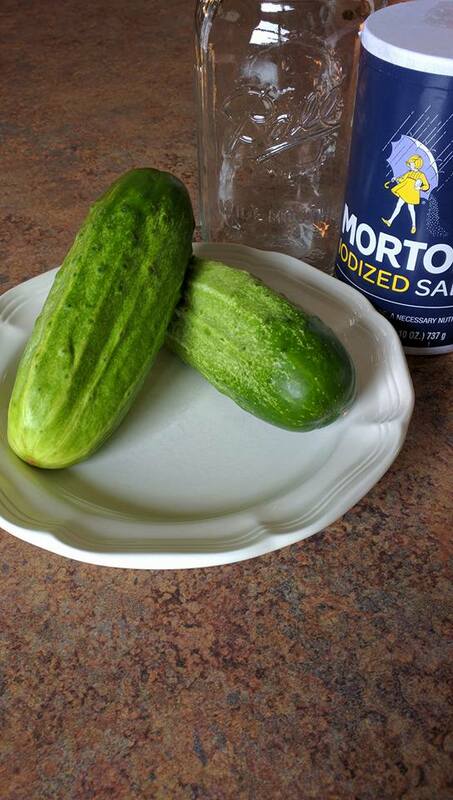 So if you want a simple, fresh-like, truly southern mountain style "condiment" to serve alongside your summertime meals....here is how you make my Eastern Kentucky mamaw's "Southern Mountain Salty Cukes!" 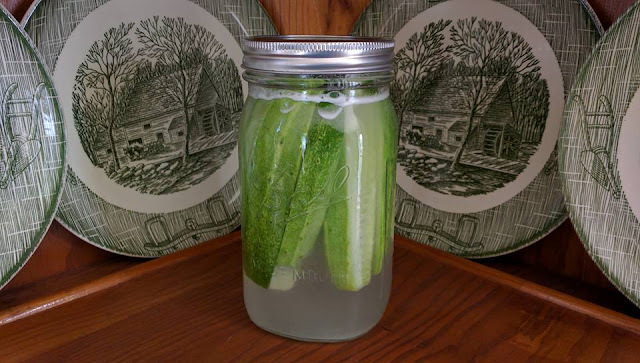 You will need fresh garden cucumbers (the pickling kind are what my mamaw usually used), a quart-sized jar or other lidded container, salt, and water. See, I told you they would be easy to make! I got my cucumbers at a little county farmer's market on a trip back to visit family in Eastern Kentucky this month. And boy, these were delicious! By the way, if you're looking for a farmer's market where you can buy fresh, good old mountain grown garden produce from Appalachia, check out Bon Appetit Appalachia's map of authentic Appalachian farmer's markets here. If you're looking for a specific Eastern Kentucky farmer's market that may not yet be on Bon Appetit Appalachia's list, the Kentucky Dept. of Agriculture has a list of KY farmer's markets that includes many Eastern Kentucky counties. That can be found here. I highly encourage you to take the trip to support any of these Appalachian farmers. You won't regret it...'cause there's nothing like down-home, garden stuff grown in the hills! 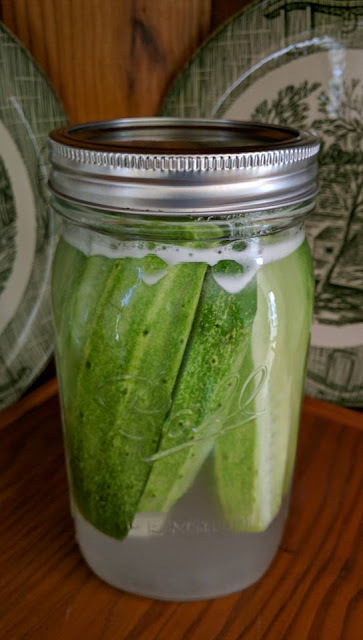 You may often hear that you should not use iodized salt to make pickles...but you needn't fret over that with this recipe...as no true pickling is going to occur. So feel free to use either iodized or regular table salt here. If your cucumbers are small, you can leave them whole for these salty cukes. 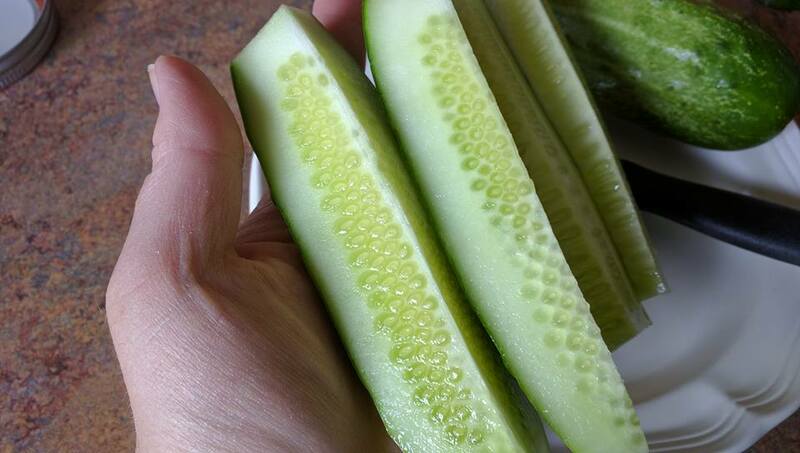 But if the cucumbers you are using are bigger, or you just want smaller pieces, slice them any way you would like. 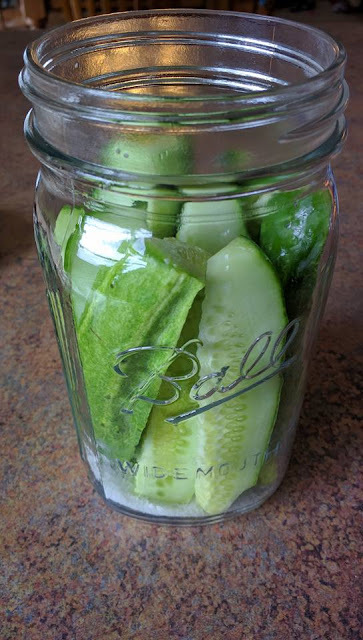 I sliced the cucumbers I used into lengthwise spears after cutting off the end. Place just under a tablespoonful of salt into a quart jar. 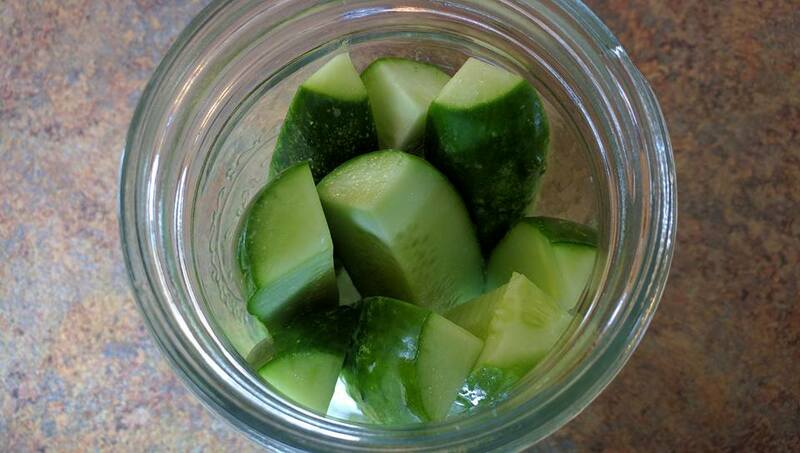 Then place your cucumbers in the jar. 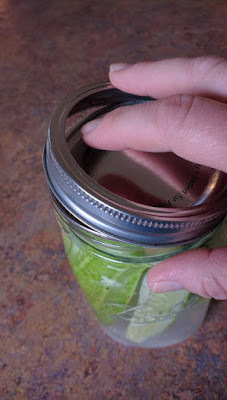 Then give the jar a good shake to mix up the salt. Leave the jar of cucumbers out overnight, or up to 24 hours. Then refrigerate. 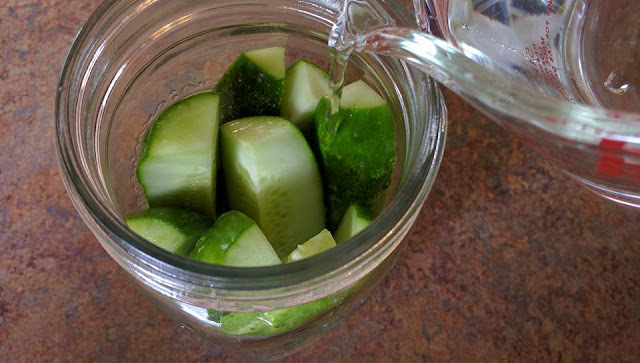 After chilling, serve the Southern Mountain Salty Cukes anytime within 2 to 3 days. Longer than that and they may begin to pickle a bit. 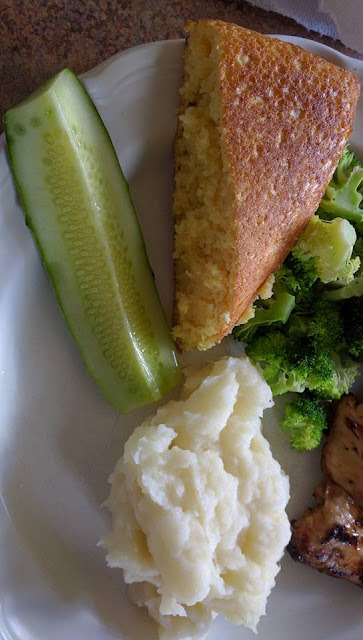 You can serve the salty cukes alongside just about any southern style meal. Their saltiness adds some extra zip to down home fare. Try them with cornbread, mashed potatoes, meatloaf, tenderloin, etc. Yum! Yep, so many good things came from my mamaw's garden down in the hills of Kentucky...but these salty cucumbers were certainly in the running for my favorite. Hope you enjoy them as much as I have over the years. The full recipe is at the bottom of this post, and a printable version can be found here. Several years ago I sketched a picture of the gate to my mamaw's garden. That gate was as old as the hills themselves. She always had two big old wash tubs hanging on it. And I can't tell you the times I've leaned over the pickets to pull on the chain of the heirloom dinner bell that to this day still stands right inside the garden entrance. Sadly, not long after I became an adult, the old gate became so worn out that it had to be replaced with a brand new version. 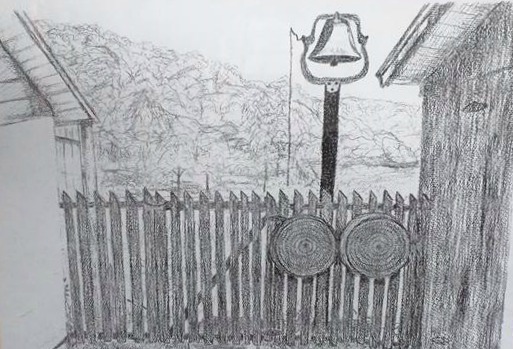 My sketch of my mamaw's old garden gate. But the picture I sketched of that old gate still hangs in my dining room as a reminder of my mamaw and all the goodness she grew inside that gate's confines. 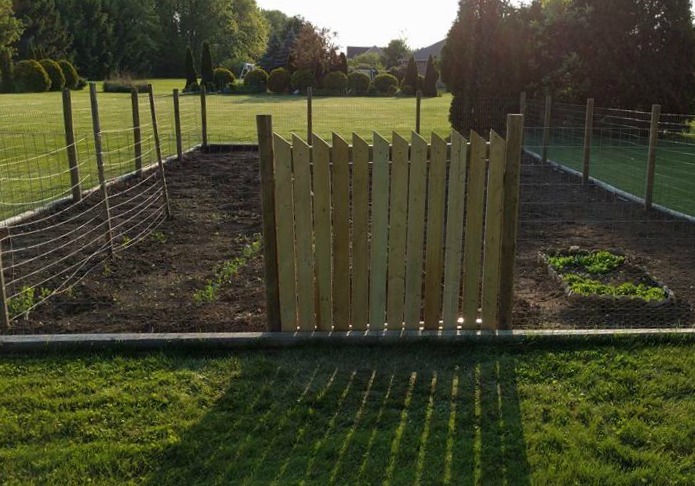 This year, City Boy made a permanent gate for his own garden in our backyard...and do you know what that man did? He did his best to make that gate look similar to my mamaw's old garden gate! Every time I look out the kitchen window and see the gate he fashioned, it makes me smile. Such a sweet gesture, and a beautiful reminder of my mamaw and the down home goodness she grew and shared with us all. I hope you enjoy the rest of your summer. I will be taking a short vacation from blogging here at Appalroot Farm to spend the last part of summer enjoying time with family. See you back here in October! Blessings to you and yours! 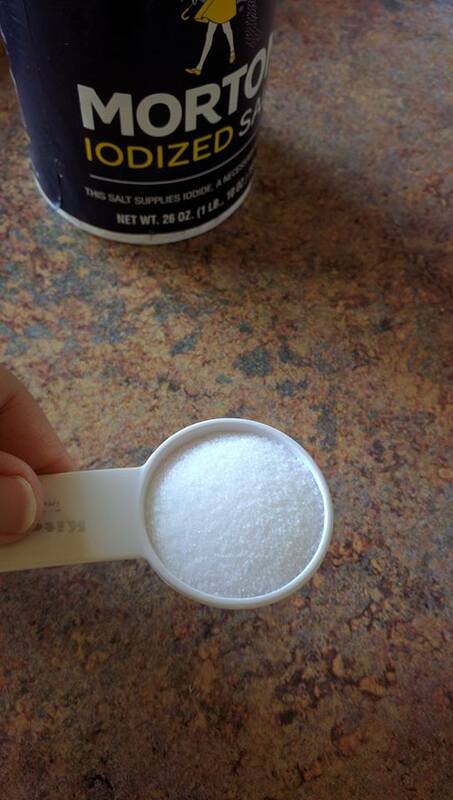 In a quart sized jar, place the scant tablespoon of salt. Slice each cucumber into 4-6 spears lengthwise, or other desired shape, and place in jar. Fill the jar completely with water and then seal with a lid. Shake the jar to mix. Allow to set at room temperature overnight, or up to 24 hours. Refrigerate until chilled, then serve immediately or within 2-3 days.